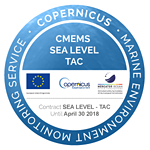 The DUACS operational altimeter sea level products are distributed by the Copernicus Marine Service (CMEMS) and the Copernicus Climate Service (C3S) (see ‘Access to the products’ webpage). The validation results of the delayed-time sea level products include the characterisation of the errors and associated uncertainties. These results are available in the CMEMS QUality Infirmation Docuemnt (QUID) and in the C3S Product Quality Assessment Report (PQAR). Further information are available in Pujol et al., 2016 and Taburet et al., 2018. The users are also provided below with the monitoring of on-line validation results of the CMEMS near real time (NRT) sea surface heights and derived variables.